Canterbury cathedral was rebuilt in the Romanesque style by its Norman archbishop, Lanfranc. It was the premier ecclesiastical seat in England and a major pilgrimage shrine. The cathedral was richly decorated throughout the centuries. 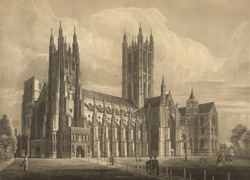 In her posthumous travelogue 'Through England on a Side Saddle' (1888), Celia Fiennes called the Cathedral of Canterbury ''the finest site there''. Daniel Defoe described it as ''a noble pile of a building indeed, and looks venerable and majestic at a distance, as well as when we come nearer''.